US President Donald Trump is reportedly demanding South Korea pay as much as double its current funding for American troops stationed in South Korea, as Seoul and Washington negotiate how to shoulder defense costs in the coming years. The Wall Street Journal reported that Trump wants South Korea to pay roughly double the current amount, equivalent to $1.6 billion per year for the next five years, citing people familiar with the talks. Other sources cited in the report say the Trump administration is pushing for 150 percent of the current deal, or about $1.2 billion. The current Special Measures Agreement, a five-year contract between the US and South Korea, is set to expire on Dec. 31. Under the agreement, South Korea is paying about 960 billion won ($854 million) per year for the stationing of more than 28,500 American troops here. Since 1991, the allies have held talks to draw up special-measures agreements on how the allies share the costs of stationing US Forces Korea here in three sectors -- payroll, construction and logistics -- to support its stable presence and protect against North Korea’s military threats. Trump has stepped up pressure on South Korea to pay a bigger share of the US defense costs on the Korean Peninsula, questioning why the US is “subsidizing” its allies’ militaries. But South Korean President Moon Jae-in has been telling local officials he is not willing to pay more, according to the report, and leaders of the top five political parties have reportedly said they cannot accept an increase, according to the WSJ report. Other US diplomatic and military officials, including Defense Secretary James Mattis and Joint Chiefs of Staff Chairman Gen. Joe Dunford, have tried to convince Trump of the importance of the alliance, apart from financial considerations, according to the report. Seoul and Washington began a new round of negotiations in March to reach the next agreement. They have held a total of nine meetings, but the two countries could not close the gap on the amount South Korea should pay, according to a South Korean official. 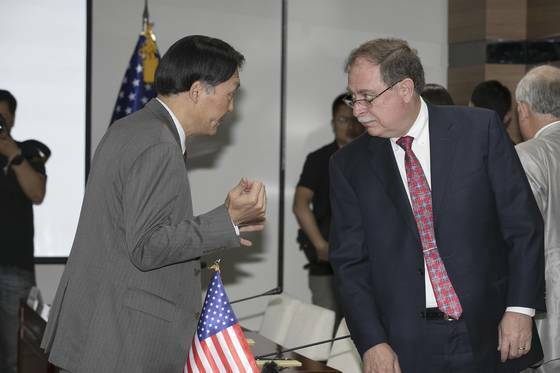 Officials from South Korea and the US are set to hold another meeting in Seoul between Tuesday and Thursday, during which they will seek to reach an agreement. “Both sides have made efforts to narrow differences over major focal points, such as the total amount, based on the results of prior consultations. We made partial progress, but we could not strike a final deal,” an official from the Foreign Ministry said on condition of anonymity after the ninth meeting held in Hawaii. The friction comes as the allies seek to maintain a united front to achieve the denuclearization of North Korea. Denuclearization talks between the US and North Korea have been stalled over their differences on who should make a concession first, while South Korean President Moon Jae-in seeks to host North Korean leader Kim Jong-un in Seoul to boost momentum for denuclearization.